Wiki in Public Preview - Help your team members understand, use, and contribute to your project. 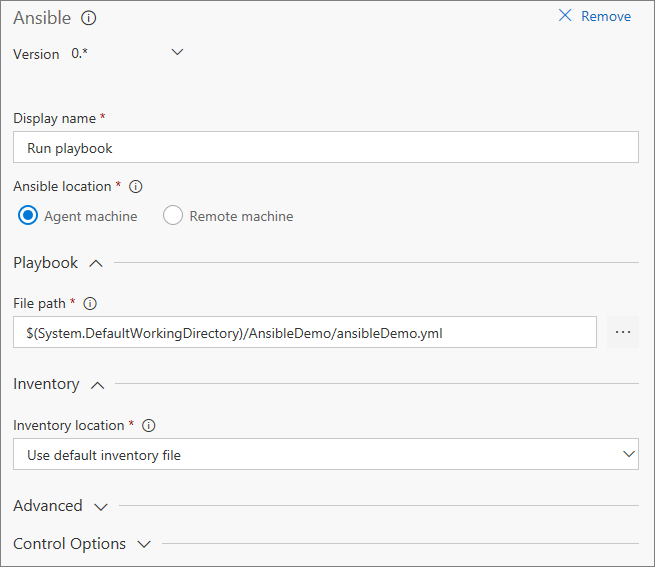 Ansible integration for Release - Execute a playbook on inventory nodes with Ansible. Branch management (stale, re-create, pushes page) - Identify stale branches, re-create deleted branches, and view pushes. Pull Request extensibility in Public Preview - Use the new API to extend the Pull Request workflow. Filter consistency across boards and test cases - Find the work items you care about quickly. We will also start asking a few of you for feedback from within VSTS to help us make the product better. Read more about in-product feedback in the Feedback section below. If you want to know the team projects which use your process, you can now navigate to the new page to show all projects that are using your process. Our Kanban board experiences now makes use of our common filtering component and is consistent with our grid filtering experience for work items. This new filtering control brings improved usability and a consistent interface to all members of your team. With the move to the common filtering component here and in other experiences, the search interaction in our command bar has changed its position and now appears with the rest of our filters. To access it simply click the filter icon. Searching for your work items is still one click away and clicking on this icon immediately sets focus on the keyword filter. In the upcoming sprint we will enable a keyword shortcut (Ctrl + F) that will allow members of your team to bring the filter in view by only using their keyboard. Note how the search interaction was previously next to the filter button. 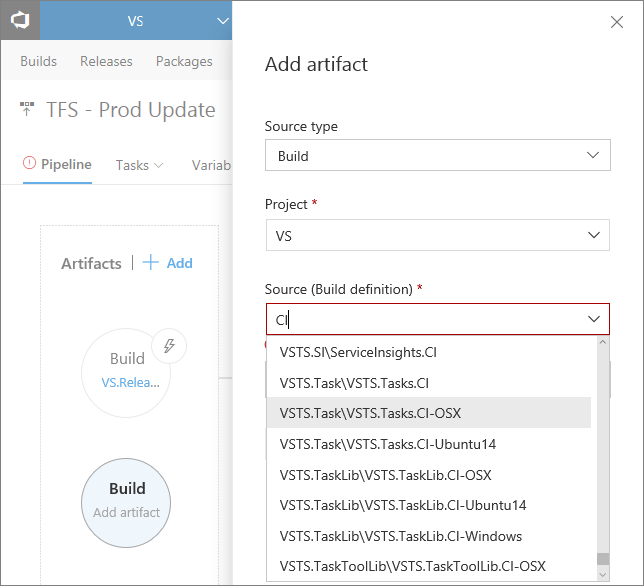 Each project in VSTS now supports its own Wiki. 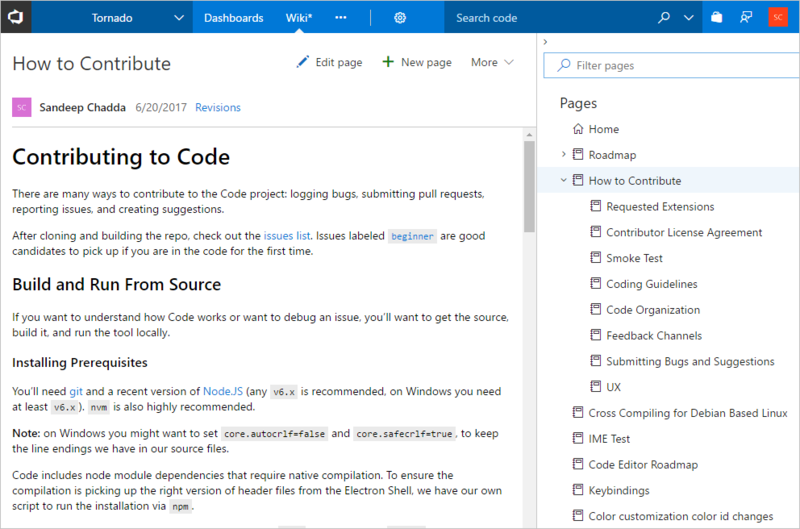 Now you can conveniently write pages that help your team members understand, use, and contribute to your project. 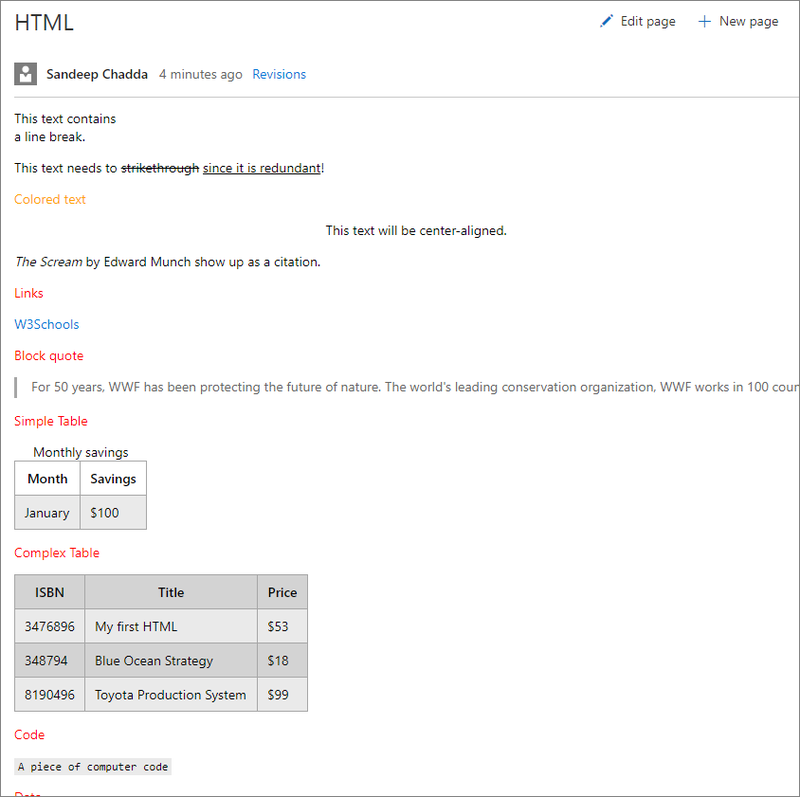 Powerful page management pane that allows to reorder, re-parent, and manage pages. Ability to filter pages by title for large wikis. The Wiki extension on the Marketplace is now deprecated. If you are an existing Wiki extension user, then you can migrate your wiki pages to the new wiki using an this migration tool. 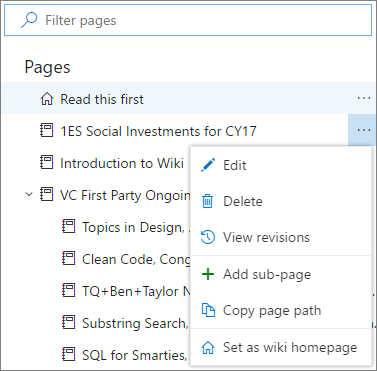 Learn more to migrate your existing wiki pages to the new Wiki. During Wiki creation, we’ve observed a pattern that people create a table of contents on a Wiki page that includes non-existent links. Then people would click on these links to create the actual pages. In our earlier experience, we were handling this scenario by giving a warning suggesting that the link was broken, or that the page did not exist. Now, we are handling this as a mainstream scenario for Wiki by allowing you to create pages instead. Teams that use TFVC often use check-in policies in Visual Studio to ensure code quality. However, because check-in policies are enforced on the client, code that is edited on the web isn’t subjected to the same policies. Several people have asked for a way to disable web-editing to protect against changes that bypass check-in policies. 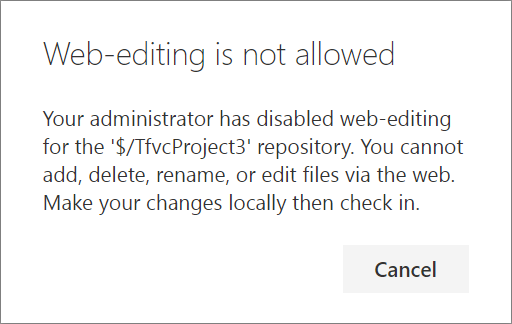 We’ve enabled a way for you to turn off web-editing (adding, deleting, renaming, and editing) for TFVC on a project/repository basis. To disallow web-editing from the Files page go to Settings, then Version Control. Click on the TFVC repo in the tree, navigate to the Options pivot, and uncheck Enable web-editing for this TFVC repository. By default, web-editing is enabled. Note: Editing the README from the Project Overview page is unaffected. If you attempt a web-edit in a project with web-editing disabled, you will be notified that web-editing is not allowed. Keeping your repository clean by deleting branches you no longer need enables teams to find branches they care about and set favorites at the right granularity. However, if you have lots of branches in your repo, it can be hard to figure out which are inactive and can be deleted. 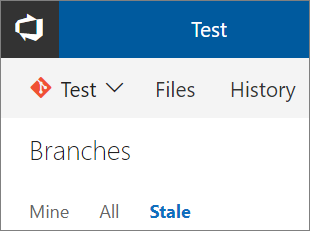 We’ve now made it easier to identify “stale” branches (branches that point to commits older than 3 months). To see your stale branches, go to the Stale pivot on the Branches page. The Branch Updates page has tremendous value. However, it was hidden as a pivot under the History hub. Now the branch updates page will be visible as a hub called Pushes under Code, alongside Commits, Branches, Tags, and Pull Requests. The new URL for the pushes page is: https://<accountname>/<projectname>/_git/<reponame>/pushes. The old URLs will continue to function. At the same time, the History hub is now renamed to Commits since the hub only shows commits. We received feedback that people were finding it difficult to troubleshoot commit related issues because the commit list view only showed detailed time on-hover. 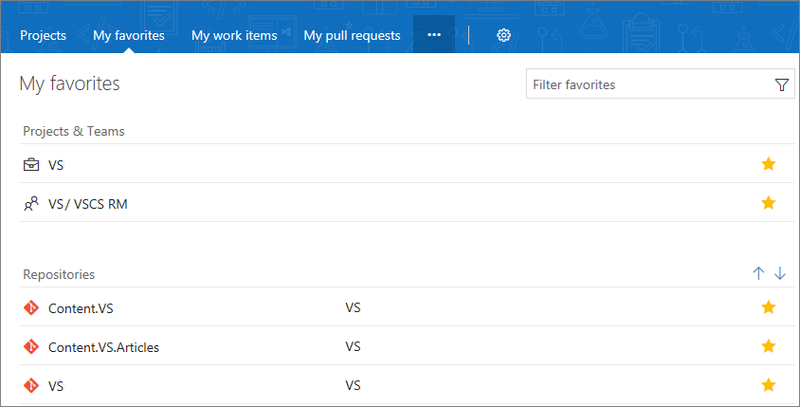 Now the commit list view across VSTS will show date and time in dd/mm/yy hh:mm format. The new URL for commits page is: https://<accountname>/<projectname>/_git/<reponame>/commits. The old URLs will continue to function. We heard feedback from people that when they filter the directory to a particular file in the Files pivot of the Code hub and later flip to the History pivot, the filename doesn’t persisted if the commit changed more than 1,000 files. This resulted in people having to load more files and filter content to find the file and was impacting productivity. Developers normally work in the same directory and want to persist to the directories they work in as they trace changes. Now, we persist the filename as you move between Code hub pivots regardless of the number of files changed in a commit. This means that you do not have to click on Load More to find the file you want. Using branch policies can be a great way to increase the quality of your code. However, those policies have been limited to only the integrations provided natively by VSTS. 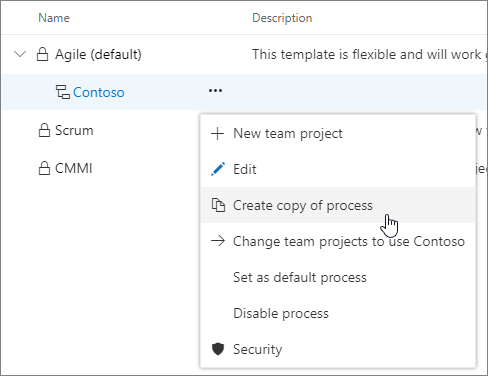 Using the new PR Status API and the corresponding branch policy, 3rd party services can participate in the PR workflow just like native VSTS features. When a service posts to the Status API for a pull request, it will immediately appear in the PR details view in a new Status section. The status section shows the description and creates a link to the URL provided by the service. Status entries also support an action menu (...) that is extensible for new actions to be added by web extensions. Variable groups have been available to use in release definitions, and now they are ready to be used in build definitions too. Learn more about creating a variable group. This has been developed and prioritized based on related suggestions for project-level build/release variables and variable groups in build definitions. The next major version of the dotnet task (2.x) addresses many of your feedback requests and fixes a set of bugs we’ve tracked for a while. First, dotnet now supports authenticated package sources like Package Management, so you don’t need to use the NuGet task anymore to restore packages from private package sources. The behavior of Path to project(s) field has changed in the 2.0 version of the task. In previous versions of the task, if the project file(s) matching the specified pattern were not found, the task used to log a warning and then succeed. In such scenarios it can sometimes be challenging to understand why the build succeeded but dependencies were not restored. Now the task will fail if the project file(s) matching the specified pattern are not found. This is in line with the behavior of other tasks and is easy to understand and use. In previous versions of the task’s publish command, the task modified the output path by putting all the files in a folder that was named after the project file name, even when you passed an explicit output path. This makes it hard to chain commands together. Now you have control over the output path file. 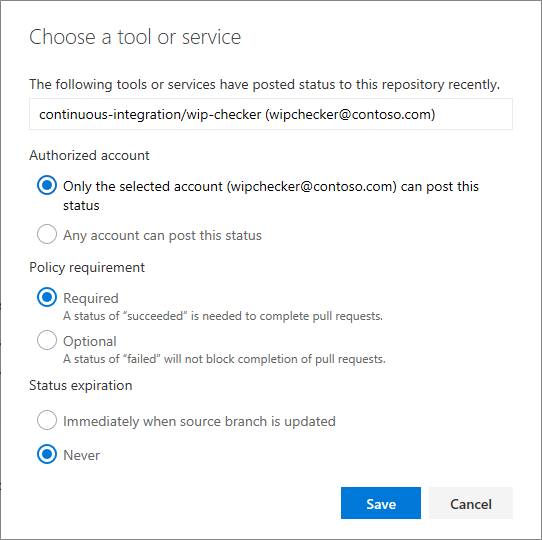 We’ve also released a new dotnet Tool Installer task that controls the version of dotnet available on the PATH and used by the new dotnet task. So, to use a newer version of dotnet, just add a dotnet Tool Installer task at the beginning of your build. We have released a new extension that includes a build/release task to integrate with Ansible and execute a given Playbook on a specified list of Inventory nodes via command line interface. Ansible uses Playbooks which express configurations, deployment, and orchestration steps in YAML format. Each Playbook maps a group of hosts to a set of roles. Each role is represented by calls to Ansible tasks. An Inventory file is a description of the host nodes that can be accessed by Ansible. The new Release Definition Editor continues to move toward feature parity with the old editor. 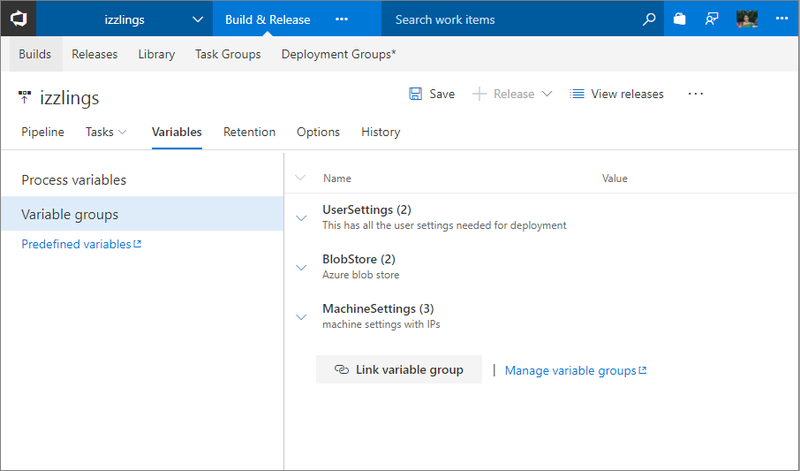 With this deployment, you can now link/unlink to variable groups, set retention policy for individual environments, and modify release definition-level settings such as release number format from the Options tab. 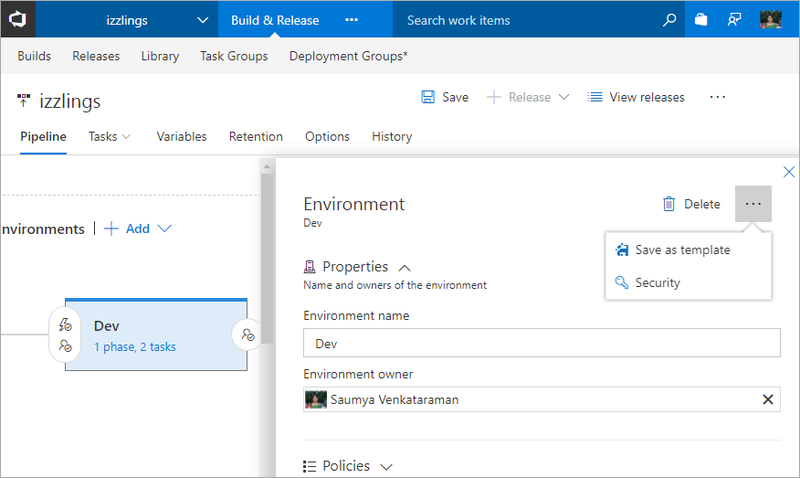 You can also save an environment as a deployment template, set environment level permissions, and re-order phases within the Tasks tab. The ability to filter/compare process variables across environments is just a couple of sprints away. Use environment level operations to save as template and set security. Today, if you want to know whether a commit is deployed to your customer production environment, you first identify which build consumes the commit and then check all the release environments where this build is deployed. Now this experience is much easier with the integration of the deployment status in the Code hub status badge to show the list of environments that your code is deployed to. For every deployment, status is posted to the latest commit that was part of the deployment. If a commit is deployed to multiple release definitions (with multiple environments) then each has an entry in the badge, with status shown for each environment. This improves the traceability of code commit to deployments. By default, when you create a release definition, deployment status is posted for all environments. However, you can selectively choose the environments whose deployment status should be displayed in the status badge (e.g. only show production environments). When adding build artifacts to a release definition, you can now view the definitions with their folder organization information and simplify choosing the desired definition. This makes it easy to differentiate the same build definition name but in different folders. Today, if a release definition is updated, you can’t directly revert to a previous version. The only way is to look into the release definition history to find the diff of the changes, and then manually edit the release definition. 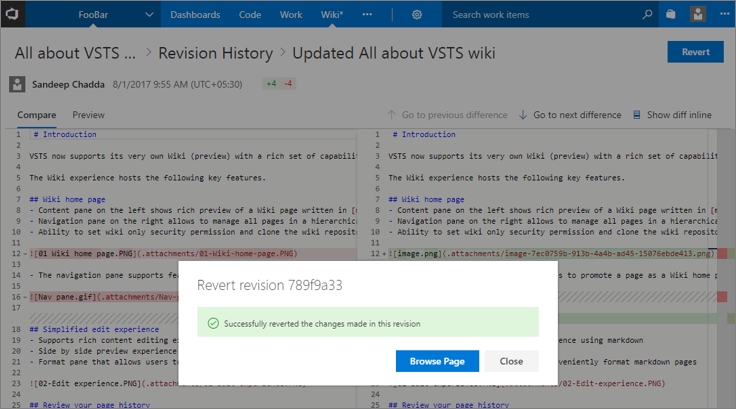 Now, using the Revert Definition feature, you can choose, and revert back to any older version of a release definition from the release definition History tab. Based on the feedback we received from teams doing exploratory testing, we are improving traceability links while filing bugs, tasks, or test cases from the Test & Feedback extension. Bugs and tasks created while exploring requirements will now be created with the same area path and iteration as that of the requirement instead of team defaults. Test cases created while exploring requirements will now be linked with a Tests <-> Tested By link instead of the Parent <-> Child link so that the test cases you create are automatically added to requirement based test suites. Finally, work items created while not specifically exploring any requirement will be filed in the team’s default iteration instead of the current iteration so that no new work items come into the current iteration after the sprint planning is complete. We are adding support for one of the top suggestions from manual testing - capturing screenshots of desktop applications from the Web Test Runner in Test hub. Until now, you had to use Test Runner in Microsoft Test Manager to capture screenshots of desktop apps. You need to install the Test & Feedback extension to use this functionality. We are rolling out support for Chrome browser, and Firefox will follow shortly thereafter. In addition to the filters on Test fields like Outcome, Configuration, and Tester, you can now filter on Test Case work item fields like Title, State, and Assigned To. 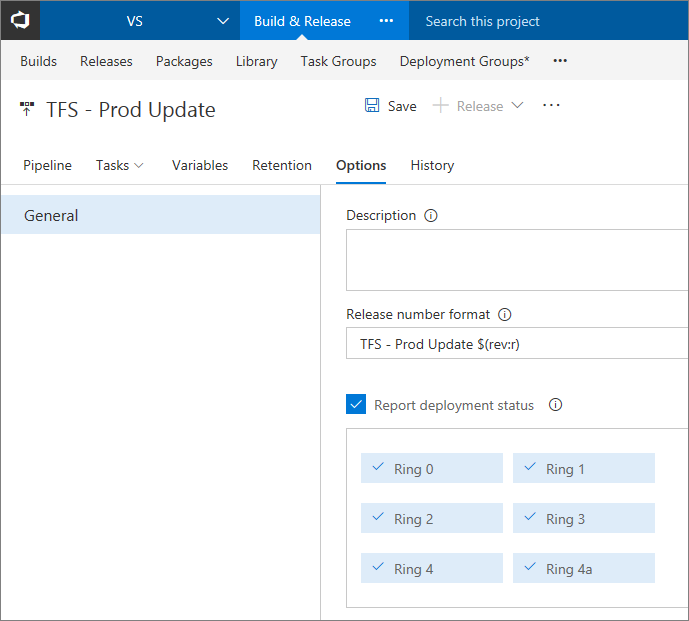 We are adding support for Release Environments in the Test Result Trend widget so that you can track status of test environments on VSTS dashboards. 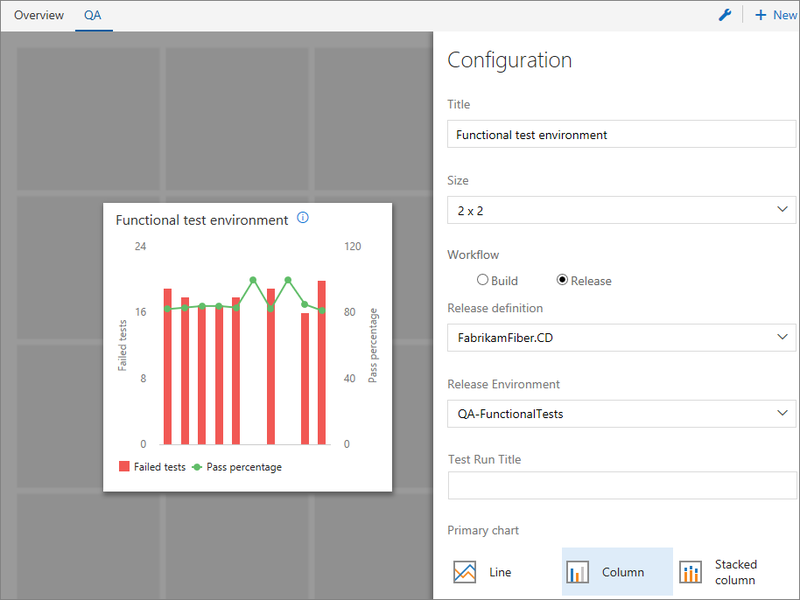 Like the way you to do for test results in Build, you can now create trend charts showing test pass rate, count of total, passed or failed tests, and test duration for Release Environments. You can also filer the charts to a specific test run within an environment with the Test Run title filter. 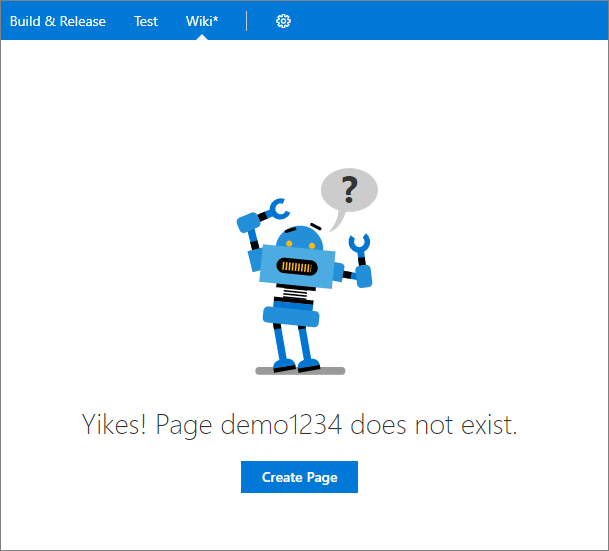 While analyzing the test result in the Build or Release summary page, or in the Test hub, you can now associate an existing bug to a failed test. This is helpful when a test is failing for a known reason that has a bug already filed. To install an extension, you had to copy install command and then browse to Visual Studio Code and execute it. Now you can directly install the extension from the Marketplace with a single click. For those using Visual Studio Code in the enterprise, a VSIX package download option is also available now. Here is an example with the PowerShell extension. 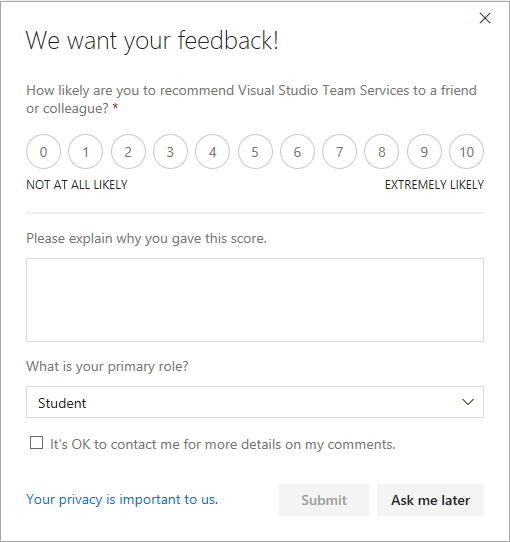 With this release, we will begin asking a small subset of you for feedback on VSTS using the industry standard “how likely are you to recommend” question, followed by an optional explanation. We expect this will give us insight into how you are feeling about VSTS overall on a regular basis so that we can learn quickly from both encouraging and critical feedback. We expect this will be a more accurate and timely approach than the email surveys we’ve relied on thus far to collect this type of feedback. As we roll this out, we are extremely mindful to guard against this becoming too annoying or getting in the way of your use of VSTS. We will only prompt the minimum number of people necessary to collect statistically relevant results for each major release. To further minimize interruptions, we’ll only ask people who visit the account and project home pages. Also, if you dismiss or click out of the dialog, we’ll prompt only a couple more times before we stop prompting you. We promise to ask you for feedback only once every 3 months and likely even less frequently, based on overall response rates. We also promise to read all the feedback, look for trends, and share the high-level insights with you from time to time. Thank you in advance for participating in this feedback channel as we continue to find ways to learn about you and improve our service to better meet your needs. We would love to hear what you think about these features. Report a problem or provide a suggestion if you have ideas on things you’d like to see us prioritize through the new feedback menu. You can also get advice and your questions answers by the community on Stack Overflow.